Fall is here! I am always looking for fresh inspiration for easy crafts I can make. I am not a super crafty person, so I need good photos to help guide me and I want to be done with it in 1-2 hours. All of these DIY fall wreaths are easy to make and any of them would look great hanging on the front door. Now I just need to decide which one to make! If you are looking for a quick fall wreath that you can make in under an hour, this easy DIY fall wreath would be one of your top choices. 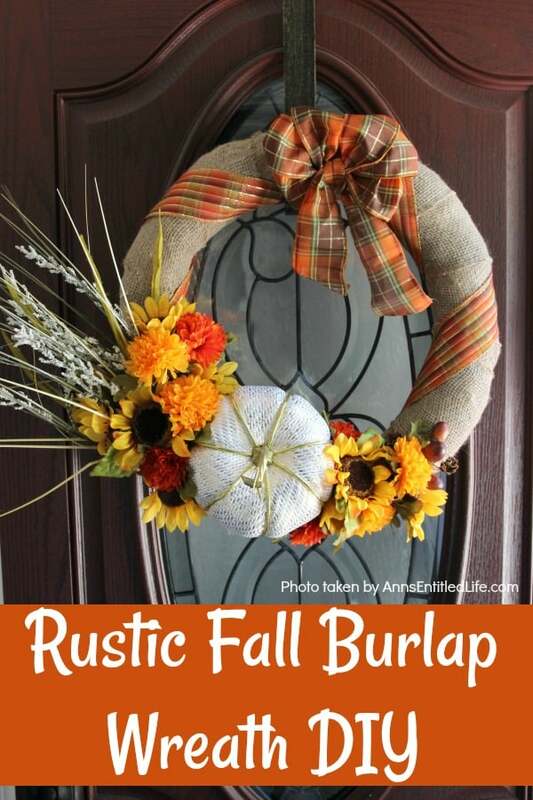 To make this wreath, you just need to purchase a burlap wreath (available at Joann’s), some ribbon, and a few other decorative fall items. You’ll also need a hot glue gun to glue everything in place. This tutorial shows you step by step everything you need to do to assemble this attractive fall wreath. This fall grapevine wreath would look very pretty on your front door, and it’s also very easy to make. You can make this wreath with grapevines from your own yard if you have them available, or you can buy an inexpensive grapevine wreath from your local craft store. You will also need some gold spray paint, a hot glue gun, some pinecones, and artificial leaves to complete this wreath. This DIY wreath would also take less than an hour to make and it’s very pretty too. 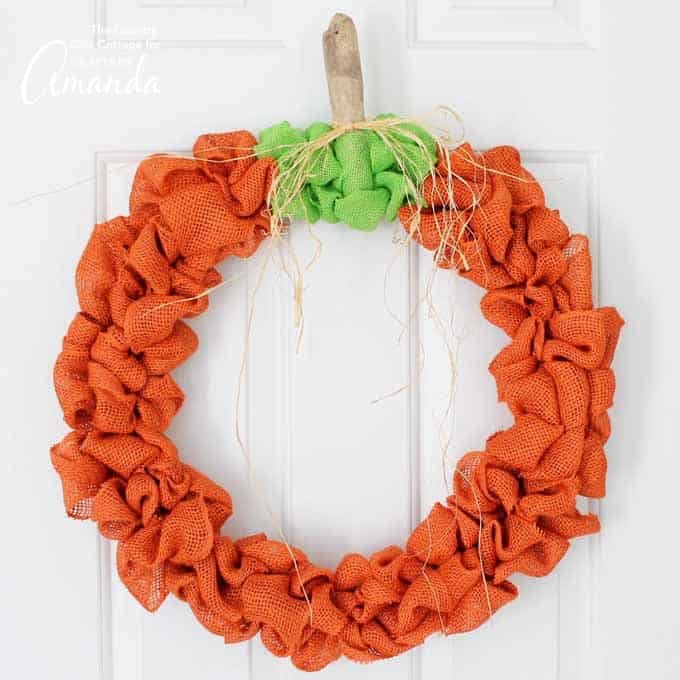 This is a really fun creative fall wreath brought to you by Crafts by Amanda. This one is going to take a couple of hours to make, but I think it would be worth the effort. It’s really cute. This fall wreath is made from deco mesh that you should be able to get from your local craft store. You cut the deco mesh in little strips, roll up the strips, and pin them to a styrofoam base in the shape of a pumpkin. This jute and ribbon fall wreath would look great hanging on a front door. It looks pretty simple to make. This wreath also has a styrofoam base, and then you wrap jute twine and ribbon around the styrofoam. 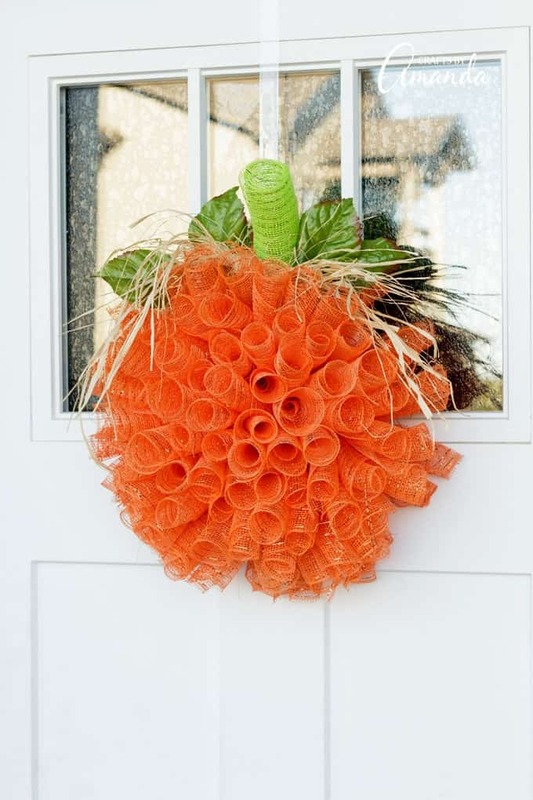 You will also need a hot glue gun and some artificial leaves to complete this attractive fall wreath. 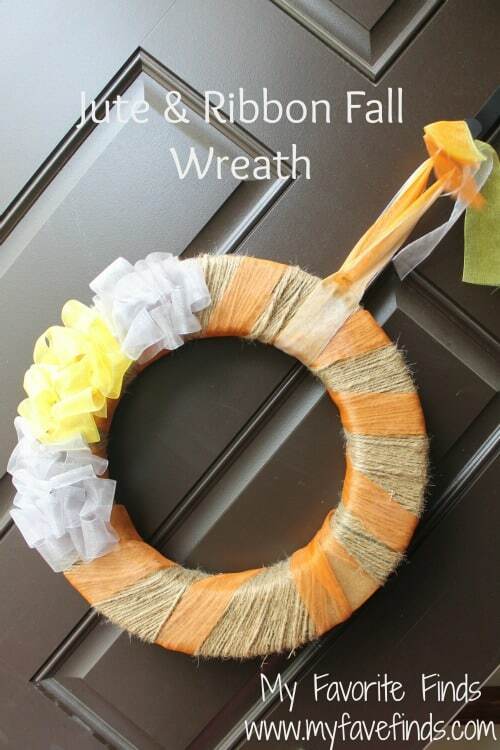 You should be able to complete this wreath in about an hour. This fall wreath made from bakers twine is really different looking, but it is pretty too and shouldn’t take long to make. 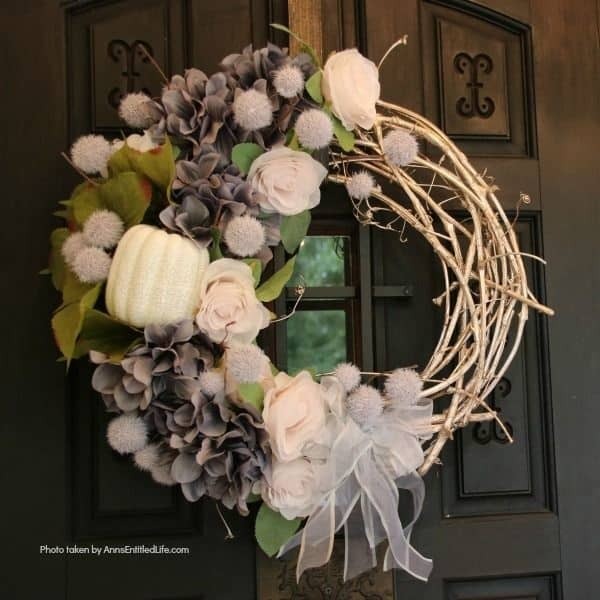 This wreath is made from a styrofoam base with bakers twine wrapped around it. It is accented with rustic looking metal leaves, which is a nice touch. This is one of my personal favorite DIY fall wreaths. I think I might have to make one myself to hang on my front door. It says it only took the person 15 minutes to make this wreath. That’s my kind of fall wreath! For this DIY wreath you will need a grapevine wreath and some berry stems you can get at your craft store. That’s really all there is to this wreath, you just arrange the berry stems in the grapevine wreath. It looks very simple, rustic, and very pretty. 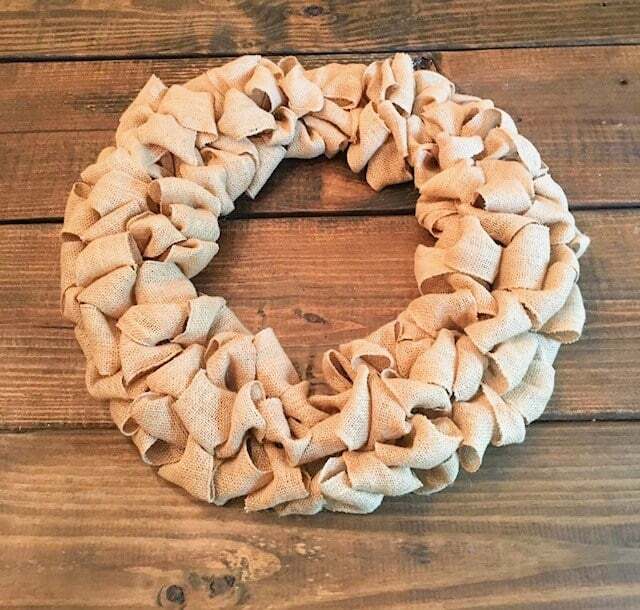 This DIY burlap wreath looks like it will take a little more work then some of these other wreaths, but I definitely like the look of it. This fall wreath is made from a wire wreath from with strips of wired strips of burlap woven through the wire frame. It looks pretty easy to make, it would look great on the front door. This shabby chic fall wreath is also a grapevine wreath, but it is has been spray painted rose gold to give it the shabby chic look. This DIY wreath is decorated with artificial hydrangeas and rose blossoms, giving it a more natural look. It’s very pretty if you like shabby chic. 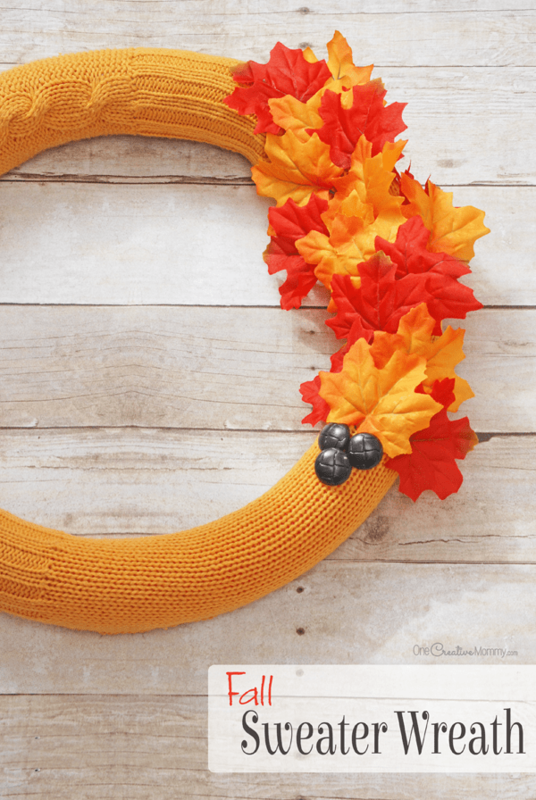 This fall wreath is really different, and creative too! This project uses a pool noodle for the wreath base, and is covered with a winter sweater. It definitely gets the award for being unique, and is pretty cute too. It looks like it wouldn’t take very long to make. 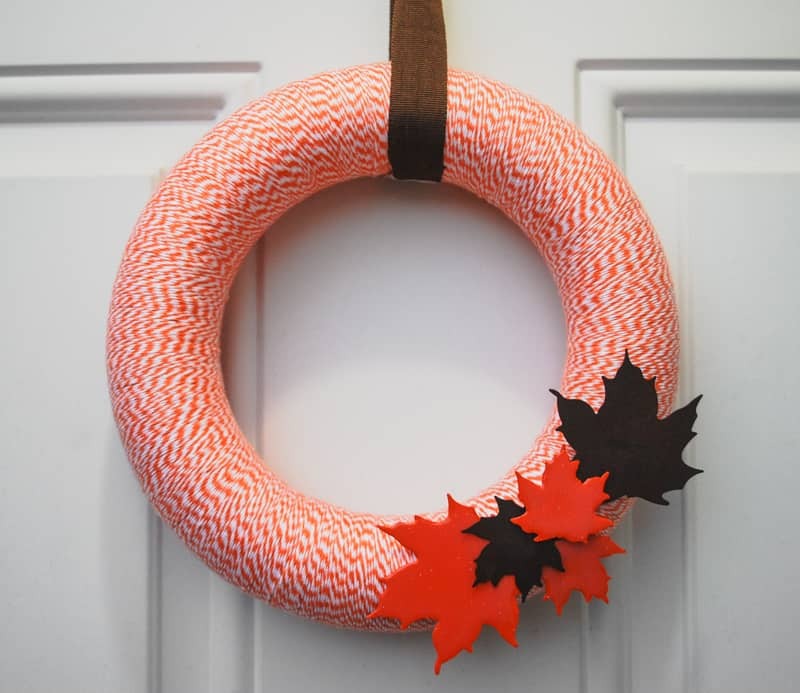 This last DIY fall wreath is really cute and definitely worth a look. It’s made from a wire wreath form with burlap woven through the wire form. The end result is a fall wreath that looks like a pumpkin. It’s super cute and would look great on anyone’s front door. 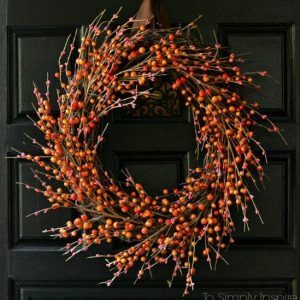 I hope all of these great photos gave you some inspiration to create a fall wreath of your own. 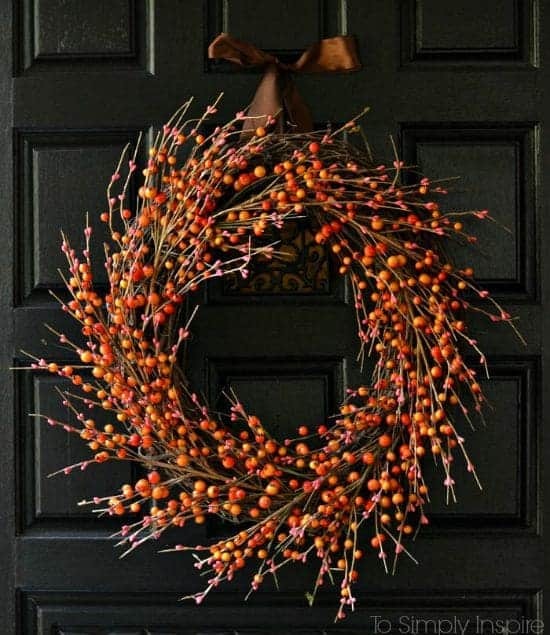 It only takes an hour or two to create a beautiful fall wreath to hang on your own front door. Enjoy! Like these fall decor ideas? You might also like this article about waxing fall laves or this one about how to make fall mason jar candle holders. Follow my Thanksgiving and fall board on Pinterest.